Orica’s troubled Kooragang Island plant is again the source of concern for Newcastle residents. With maintenance shutting down operations for a few weeks, Orica was left holding thousands of tonnes of ammonium nitrate with nowhere to store it. Onsite storage constraints, and other locations still at the development application approval stage, meant the company’s response was to send the excess 3000 tonnes of ammonium nitrate out to sea. The MCP Kopenhagen has become a temporary floating storage facility for this hazardous material. Dr Mariann Lloyd-Smith, Senior Advisor to the National Toxics Network speaks with Third Degree's Jessica Minshall. In Malaysia, Australian mining company Lynas Corp has seen fierce criticism of its plans to operate a controversial rare earths processing plant in Kuantan. The debate has been raging for more than a year. But now, Lynas is suing a local campaign group and an alternative news website for defamation. And unlike Australian law, Malaysian law has no cap on damages that can be awarded for defamation. Associate Professor Joseph Fernandez, Head of Curtin University’s Journalism Department speaks with Third Degree's Simon Unwin. 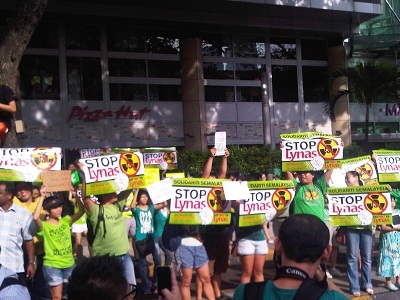 Also featured are 'Save Malaysia, Stop Lynas' group campaigners with audio recorded by Third Degree at a Sydney forum in 2011.